This weekend, I held an event called "Coffee and a Card". I provided coffee & tea and my customers were able to come over, make a card, have some girl time, and browse the catalogs and specials. This is the card that I made for them to put together. I had seen a card similar to it online, but I changed the color combo and a few other things to make it "my own". I love the chalkboard technique and decided to use it on this card by using the Smoky Slate cardstock as my "chalkboard". 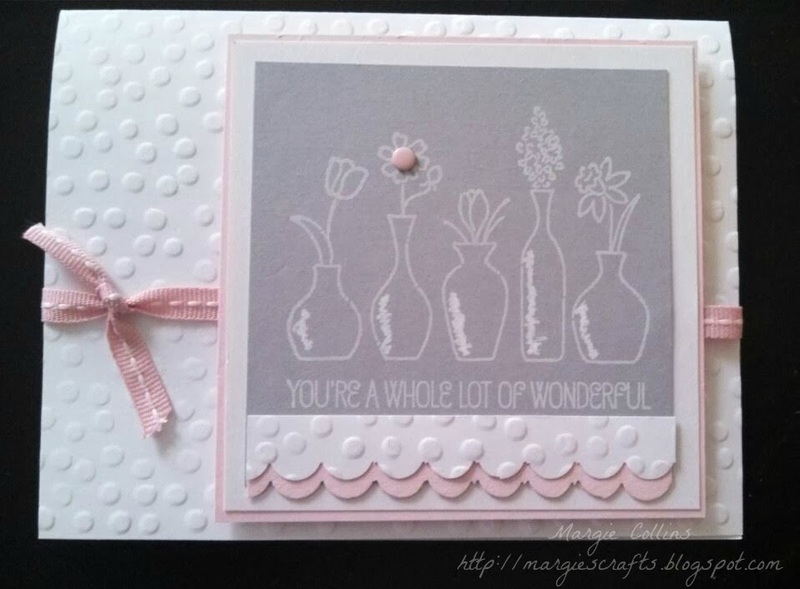 The base of the card was embossed using the Decorative Dots Embossing Folder that you can get FREE with any purchase of $50.00 or more during Sale-A-Bration. Don't forget ALL items count towards Sale-A-Bration totals AND Stamping Points! Happy stamping!